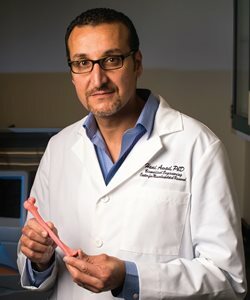 Biomedical Engineering Professor Hani Awad and colleagues at Cedars-Sinai Medical Center have collaborated on a study that resulted in a new technique that successfully helps bone regenerate itself across large gaps in severe fractures. This method, which combines gene, stem cell, and ultrasound therapies, has been successfully demonstrated in animals. Professor Hani tested healed animal fractures in the Center for Musculoskeletal Research’s Biomechanics Lab with the help of a 2015 graduate of our Center for Medical Technology and Innovation master’s program, Jayne Gavrity. Jane Gavrity is now a research engineer with Smith & Nephew. About 100,000 people in the United States experience severe fractures that fail to heal each year. The standard of care for these injuries often involve long hospital stays and repeated surgeries that still result in long-term disability. However, this new technique, which improves upon other investigational therapies, has the potential to one day replace current procedures for treating severe bone fractures in humans. For more information, read the Science Magazine article here: http://www.sciencemag.org/news/2017/05/tiny-bubbles-and-bit-gene-therapy-heal-major-bone-fractures-pigs. The full study can be found here: https://www.ncbi.nlm.nih.gov/pubmed/28515335.